She's Fantastic: Dark Knight Rises CATWOMAN Movie Masters! 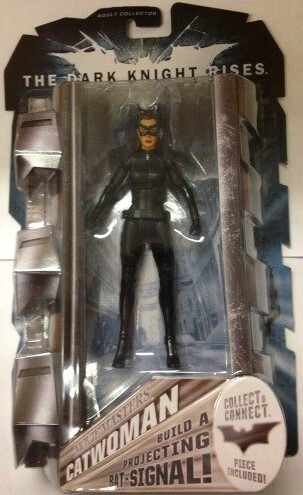 Dark Knight Rises CATWOMAN Movie Masters! If I confessed how much gas I wasted driving around trying to hunt down these two figures you would be ashamed of me. I broke down and ordered them on Amazon for $16.99 each (with free shipping) a few weeks ago. I ordered two and luckily received both variations. I don't now why I hesitated so long, I think next time I will order right away, although I will always wax poetically about the thrill of the hunt. These figures are arguably the best Anne Hathaway Catwoman products made so far. They don't have a perfect likeness, but when you consider price, playability, and overall aesthetics, they really can't be beat. The two versions are a "Goggles-up" and "Goggles-down" version. There was some talk about the variation actually being the same figure, just with a packaging variation, but I assure you, the goggles do not move and they are indeed unique headsculpts (or at least different head-accessorizations). From what I have read, they have equal distribution, so no inflated "chase" prices should affect either one in the secondary market. For those readers into packaging details, I found it interesting that both Catwomen are in identical plastic trays (i.e. the Goggles-down version has the impression of cat ears). These figures do not come with any accessories, but they do each come with two pieces for the 6-part Collect-n-Connect Batsignal: The base and the control box on a post. The figures themselves are pretty great. The bodies are VERY similar to the DCSH Catwoman from 2008 with some texture and sculptural details added. The faces are really fantastic. Like I mentioned before, they aren't a perfect Anne Hathaway likeness, but it's pretty good in my opinion. The poseability is really fun and Mattel has really cornered the market with poseable female action figures. From Left to Right here is: DC Direct Hush Catwoman, Mattel Arkham City Catwoman, Mattel DKR Movie Masters Catwoman Goggles-up, Mattel DKR Movie Masters Catwoman Goggles-down, DC Direct Arkham City Catwoman, Mattel DCSH Catwoman.